Venarus Vulpin is an Imperial vampire in Redwater Spring. 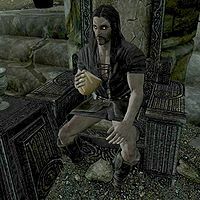 He moved to Skyrim from Summerset Isle in search of the "Bloodspring of Lengeir's Feast", a fabled source of power for vampires that was believed to be in a ruin buried during the second era. He made his way from Alinor to Solitude by ship, and then ran into a female vampire in a local tavern who pointed him in the direction of the Rift. After finding the Bloodspring in Redwater Spring, it turned out not to be everything he had hoped. The great power it grants only lasts a short while and besides weakening the body it is also very addictive. He then turned the place into a skooma den, mixing the addictive blood into the skooma to ensure a constant source of food. He is hostile when you encounter him, and a powerful enemy, using mainly Destruction and Conjuration in combat. He carries a key to the wooden door at the end of the boss chamber, which leads to the Bloodspring. His journal is found at the end of the long corridor at the start of Redwater Spring, and his research notes can be found further into that zone, on the altar near where you encounter him. Upon death, Venarus' corpse will sometimes read "Master Vampire" instead of his name. If you are a sufficient level, there may be multiple Master Vampires in the chamber. His body is the one with the Redwater Wellspring Key. This page was last modified on 13 June 2014, at 00:43.